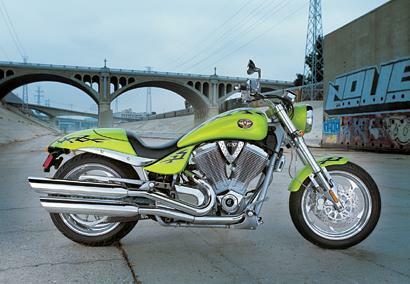 Victory will add two new cruisers to its lineup for 2005, dropping one in at either end of its range. The Hammer has been brought in to answer calls from Victory customers for more power and gets and extra 127cc over the standard 1507cc engines in all the other bikes – this brings it up to the magical US figure of 100 cubic inches. Not only does the bike get a bigger engine but it has also been treated to a sixth gear to make motorway cruising more enjoyable, and the frame has been modified to give the bike a slightly greater lean angle. To cope with all this the firm has equipped the massive 250 section rear tyre. To shoe-horn it in to the frame they had to narrow the drive belt but Victory has calmed any worries about the strength of the belt by adding Carbon fibre to make it as strong as the original. The Victory Vegas 8-Ball has been launched as an entry level version of the Vegas that is much less adorned than the rest of the range but also much cheaper. But rather than just producing a cheaper bike Victory has made the 8-Ball so that it will accept all the performance and cosmetic enhancing parts that fit the rest of the range. So in other words you can buy a slightly cheaper bike and build it up as and when the budget allows. Across the rest of the range the rest of the bikes get redesigned, more sculpted, saddles that are supposed to more comfortable for taller riders by giving more back support. And all bikes will now be fitted with self-cancelling indicators.